In the event of an emergency, it is essential that the battery system performs as designed, or the substation may be left unprotected. Although many test methods can be performed to estimate the condition of the battery, the discharge test at specific time intervals and specific discharge rates are presented as the necessary tests, and the only method that can measure the real capacity of the battery. Nowadays, capacity tests are not performed because of the belief that this type of testing is too expensive, requires a lot of time, and damages the battery. Most battery users today apply the internal resistance measurements to determine the battery’s state of health and to save time. 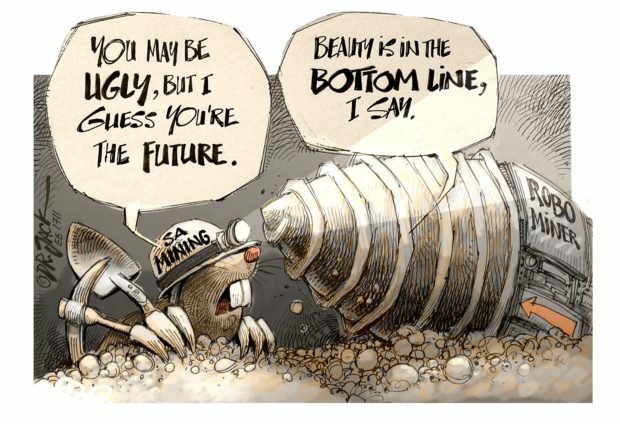 This approach is not wrong but the real capacity cannot be decided from this test. This article describes certain initial conditions, which should be met before the discharge tests, as well as how to save the time required by the discharge testing using the load bank for internal resistance measurements. The type of testing discussed here is the constant current discharge test, along with the load bank and external load, as well as the discharge test using modified load profiles. Fig. 1: Measured battery voltage as a function of time in five discharge tests on Powerfit S312/7S. Preparation is important to perform the test correctly. Before the test starts, prepare the equipment to comply with the safety standards. After that, it is important to ensure that cell connections are in proper condition and that the charger has been disconnected. The load connected to the battery must be backed up, or the current taken by the load must be included in the discharge rate. It is important to emphasise the test preparation and conditions before its start can affect the test results. Bearing this in mind, it is important to check the key parameters such as the cell voltage, float voltage and electrolyte (cell) temperature before the test starts. The load unit and additional systems may be connected once the initial conditions are met. There are some misunderstood facts in battery testing, especially capacity testing. Mistakes are made as a result of myths, misunderstandings and lack of training and experience. This myth creates confusion among test professionals. Excessive charging and discharging with too many cycles will reduce the service life. However, when conducted in accordance with the applicable standards and manufacturers’ recommendations, capacity testing will not reduce the battery service life. The effect of the performance test on a battery was analysed on a Power-fit S312/7S battery. The discharge test was performed with higher discharge rate and reduced test time. Fig. 1 illustrates the test results obtained from the battery. After being subjected to five discharge tests, the voltage values and the capacity levels at the last test were compared wih the results of the first test. This confirms that five more discharge cycles will not ruin the battery. The capacity test is often not performed as it is considered expensive, and the load bank is replaced by hand-held instruments for internal resistance measurements, the reason being that the internal resistance would indicate the battery’s state of health. It is not a direct correlation although internal resistance does correlate with capacity. Capacity cannot be determined by this kind of test. 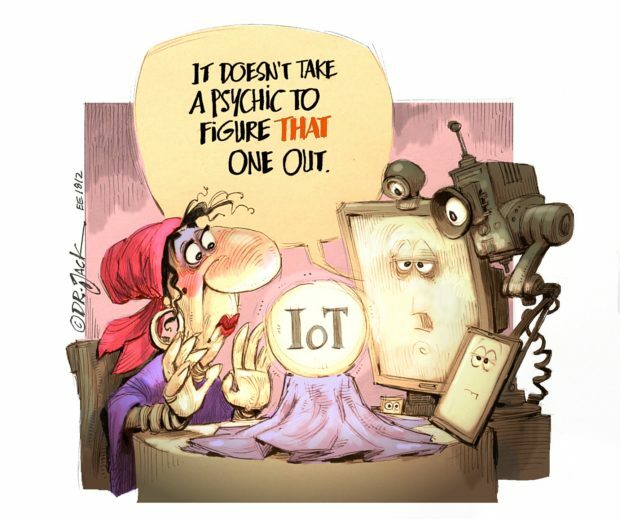 The internal resistance indicates a problem and this data must be confirmed with additional measurements such as capacity testing. Fig. 2: Load profiles for internal resistance measurements using load banks. Internal resistance can be tested using a proper load bank providing different load profile settings. To measure the internal resistance using a load bank, first establish a specific discharge characteristic to establish the two points. After a 20 s discharge at a defined current, the voltage is read and provides the first point. The discharge is then interrupted and the battery is left in an open circuit state for between two and five minutes. The voltage value is recorded again, after five seconds, in the second discharge interval, with a higher current level. Measurements based on this method were conducted on a Powerfit S312/7SR battery while fully charged. 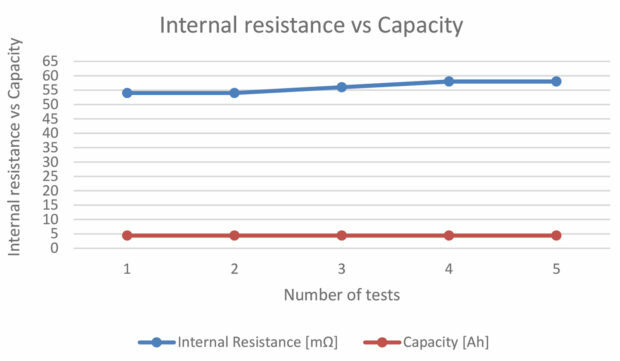 The resistance and capacity calculated did not change in five tests, as shown in Fig. 3. Additional tests were conducted on the Sonnenschein 2EPzV 200 battery. The battery was subjected to capacity testing to determine week cells in the string. After the discharge test, the battery was recharged and subjected to the internal resistance test with load bank to determine the differences in resistance between the cells which passed the capacity test and those which failed it. Cell voltages during two discharge intervals were measured with a battery voltage supervisor system. 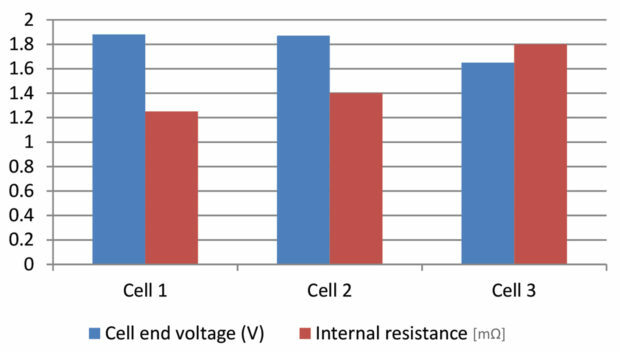 The differences between internal resistance on cells with good capacity and on ones with poor capacity are shown in Fig. 4. The cell with the lowest cell voltage at the end of the capacity test had the highest internal resistance. Fig. 3: Internal resistance vs capacity on Power fit S312/7SR battery. This depends on whether the battery system is new or fitted to an existing system about to undergo performance testing. A commissioning charge should be performed when a new battery is installed and the acceptance test is to be done. The battery will be fully charged and ready for the test. The battery should also be placed on float for at least three days. Battery manufacturers publish their recommendations for charging procedures in their installation, operation and maintenance manuals. Prolonged battery operation outside the manufacturer’s float voltage limits will reduce life expectancy. For example, VRLA batteries need not be equalised before performance testing unless it is recommended by the manufacturer. It is not uncommon during the performance test for one or more cells to fail before the end of the test. Terminating a test as soon as the first cell fails may result in incomplete or wrong test results. The total string voltage should be used as a test terminating criterion. Fig. 4: Differences between internal resistance on cells with higher capacity and failed cell. Bypass week cells except where the test has run 90 to 95% of its course. In such cases, the weak cell can remain in the string until the end of the test. Cell voltage non-uniformity is present during testing; some cells are above the end voltage value, some are below. Terminating the test when one cell reaches end voltage will reveal other damaged cells in the string, which is the main reason for the test. A test team member should be prepared to bypass the cells during the discharge test. The bypass can be done by pausing the test and then bypassing the cell with appropriate connectors. All safety precautions should be followed during this procedure. The string voltage must be recalculated and the test continued with the new end-voltage value. The maximum time allowed to finish the bypassing process is six minutes or 10% of the total expected test time. Temperature affects cell performance. As the cell’s temperature increases, internal resistance as well as the chemical reaction which improves battery capacity decreases. However, keeping the battery warmer than recommended will cause a higher level of active material shedding, gassing and grid corrosion which, in turn, would reduce service life. This includes ambient and cell temperature. Battery manufacturers always publish recommended operating temperatures for their batteries. If the operating temperature of the battery system is above or below the recommended temperature, a correction factor must be applied after the test. Once the initial conditions are meet, the load unit and other necessary test equipment must be connected and set up properly. The first step is to define the test current, end voltage, and test duration. These parameters are found in the manufacturer’s published data and recommendations. The battery installation used for testing had 126 cells and the string voltage of 252 V. The manufacturer’s recommendations for the discharge test of this battery are shown in the Table 1. Fig. 5: Total string voltage on the battery that needs to be replaced. It is important to emphasise that current values are not adjusted for temperature. After completing the test and calculating the battery capacity, it is necessary to perform a temperature compensation. It is advantageous to use a powerful load bank or a load bank with an external current measurement feature to measure and to include in the test the current that has been withdrawn from the battery by regular or any other additional connected load. The terminal voltage was measured during the entire test as a function of time, and the battery should be discharged until it reaches the minimum terminal voltage, or once the total test time has been reached. The Coup de fouet phenomenon is shown in Fig. 6 and represents a dip in the voltage drop present on a fully charged battery at the beginning of the test. This drop in the voltage and the maximal voltage after the recovery depend on the battery age, discharge rate, float voltage and other operating conditions. This partial discharge with controlled load discharge will cause the Coup the fouet. It can be considered as a useful tool in determining battery state of health. It is important to monitor the behavior of the cells within the string by measuring the cell voltages at least three times during the test. One measurement should be taken at the beginning of the test and the others at specified intervals. The sample rate should be more frequent when the voltage starts to decrease faster. This approach makes it easier to spot a bad cell and predict failures well in advance. Individual cell voltages can be measured manually by using a handheld voltmeter or an automated monitoring system. Note that, where one cell voltage drops below the end voltage, the test should not be stopped and restarted once the failing cell was replaced, especially where it occurs early in the test. For example, if performing the eight-hour test, the week cell must be bypassed within six minutes and the test continued. The general rule is that a test interruption should be 10% of the test time if the test is interrupted for a longer time period and the string retested again. Depending on the condition of remaining cells, some may fail and create more problems. Fig. 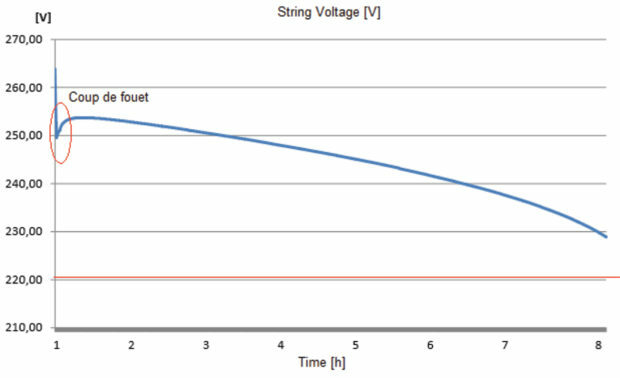 6: String voltage as a function of time. The battery capacity is usually expressed in Ah. However, the capacity at the end of the test is always expressed as a percentage of the manufacturer’s published capacity. IEEE standards define the two methods for capacity determination. In the time adjusted method, the test current is kept constant as defined in the manufacturer’s published table as a function of the selected test time duration. The battery capacity is calculated after the completion of the test by using the published performance data at 20°C. This method is recommended for the test whose duration is longer than one hour. C = Capacity at a specific temperature recommended by the manufacturer. Ta = Actual time duration of the test until reaching the specified string end voltage. Tm = Manufacturer’s rated time to reach the string end voltage. Kt = Temperature correction factor according to the IEEE standard. This method is recommended for performance or acceptance tests whose duration is one hour or less. There are two options of this method based on the discharge rate for testing: adjusting the manufacturer’s recommended rating for the end-of-life condition or using the full recommended rate. The adjusted manufacturer’s rate method is preferred since testing an aged battery at a high rate may result in short run time. In this method, a time duration is kept constant and the rate is adjusted based on the derating factor to simulate the end-of-life condition (80% of the rated capacity). C = Capacity at the specified temperature. Xa = Actual rate used for the test. Kc = Temperature correction factor as per the IEEE standard. Xt = Manufacturer’s provided rating for time to reach the specified end voltage. Table 1: Manufacturer published ratings at 20°C. The recommended practice is to replace the battery if its capacity is below 80% of the manufacturer’s rating. Following the test, it is necessary to review the battery sizing to determine whether the remaining capacity is sufficient for the battery to perform the intended function. A capacity of 80% indicates that the battery rate of deterioration is increasing even there is still capability to support the load. Additional characteristics such as abnormality of cell temperature and cell voltage are often require complete battery or cell replacements. The cell voltage is a good indicator for further investigation and cell replacement. In case we use replacement cells, it is important to ensure that they have electrical characteristics compatible with the existing cells and that they should be tested before installation. One of the main goals in the battery testing area (besides learning the real condition of the battery) is to reduce the test time. Several techniques and test systems are used to achieve this. Battery manufacturers’ publications provide two parameters: capacity and internal resistance. Capacity is the only proven way to judge the condition of the battery during the entire service life and it does not depend on the measurement equipment used. The internal resistance measurement technique is not standardised and the techniques are proprietary. When conducted in accordance with IEEE recommended practice and in line with the manufacturer’s maintenance instructions, periodic performance testing will not ruin the battery and cannot be considered excessive or unnecessary. Using load banks with extended features enables users to increase loading capability, reduce test time, and create less wear and tear on the battery. A load bank that creates different load profiles can be used for internal resistance measurements to observe changes in battery condition. A capacity test interval can be planned depending on the degree of a change. According to regulations set forth by NERC and IEEE, battery capacity testing is recommended and should be performed properly. IEEE 1188-2005: “IEEE recommended practice for maintenance, testing and replacement of Valve-Regulated Lead-Acid (VRLA) batteries for stationary applications”, 2006. IEEE 450-2010: “IEEE recommended practice for maintenance, testing and replacement of vented Lead-Acid (VLA) Batteries for stationary applications, 2011. Rick Tressler: “Myths, misunderstandings and mistakes,” Battcon Stationary Battery Conference. IEC 60896-21: “International standard for stationary lead-acid batteries,” 2004.